In a joint partnership project with our textile and recycling contractor, Lewisham Council are trialing the collection of textiles using what is being called the Sir Vivor bag. Unlike other collections that utilise ordinary sacks that are just left on the doorstep for collectors to take, this one tries a whole different way to recover those textiles in the best condition it can. 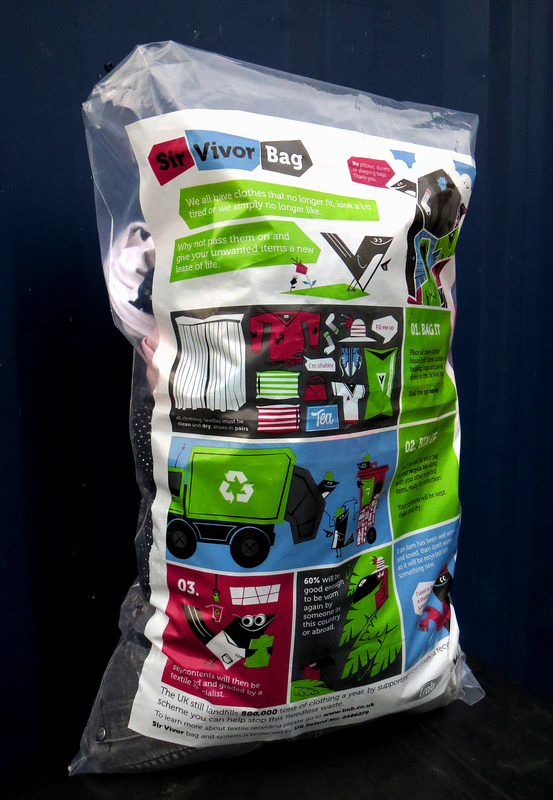 Fill the Sir Vivor bags with your unwanted textiles and then place the bag/s in your recycling bin. 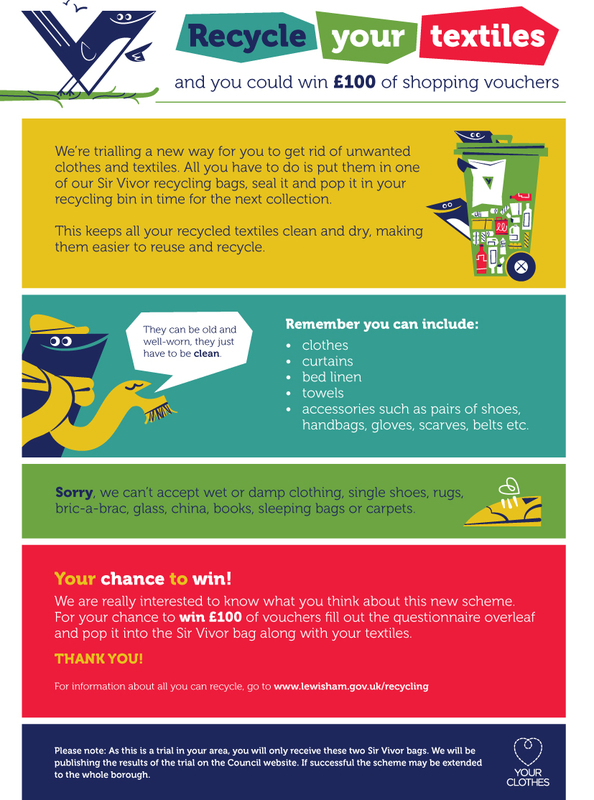 Residents are probably used to the idea of putting textiles in their recycling bins at the moment and whilst this is an OK method of collection, there are quality issues to think about. We also encourage residents to think about using charity shops and dedicated textile banks first before putting their textiles in the recycling bin loose. Putting items in loose does leave them vulnerable to damage and being soiled as they enter the compactor and then are tipped at the other end with all the cans, bottles, cardboard, plastic bottles and juice cartons. With this survival bag, the air is compressed out during compaction and the thicker plastic sacks protect the items inside until its tipped and recovered at the materials recovery facility (MRF) in Bow, East London. The scheme is being trialed in parts of Grove Park, Lower Sydenham, Bellingham, Crofton Park, Forest Hill, Catford South, Hither Green, Brockley, Blackheath and Ladywell. For those properties that fall in the trial zone, you will be receiving a couple of the Sir Vivor bags with a leaflet (see above). This details what can and cannot go into the sacks and there will also be an opportunity for those that submit some feedback to have a chance of winning £100 worth of vouchers. Full bags will find their way to LMB Textiles via the Bywaters materials recovery facility. The full sacks go into your recycling bin (preferably at the bottom where it can’t be seen) and then you use your recycling bin as normal. After collection, the bags will go to our textile contractor LMB Textiles http://www.lmb.co.uk/ where they will be reused and recycled. Categories: Textiles, Uncategorized | Tags: Bywaters, clear sacks for textile recycling, LM Barry, LMB, Recycling textiles in Lewisham, reusing textiles, Sir Vivor Bags, Survival bag for textiles, textile recycling, Textile recycling in the recycling bin, Textile survival bags | Permalink.